We carefully format your manuscript to give your reader the best possible eReading experience on any device. We work with Word, RTF, InDesign, PDF even printed books if necessary. We’ll distribute your eBook via Amazon and Ingram including 79 ebook sellers like iBook, Nook, Kobo, etc. We setup your accounts or help you do it. You keep 100% of royalties. 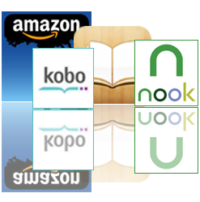 If you’re hoping to publish your eBook on Amazon, Kobo, Barnes and Noble or iBook, we can help manage the process from rough manuscript to online bookstore.